The people of Dobroye, a village in Lipetsk Oblast, 270 miles southeast of Moscow, celebrated their love of lard called "salo" in Russian by organizing the “Dobroye salo” (Good Lard) festival. 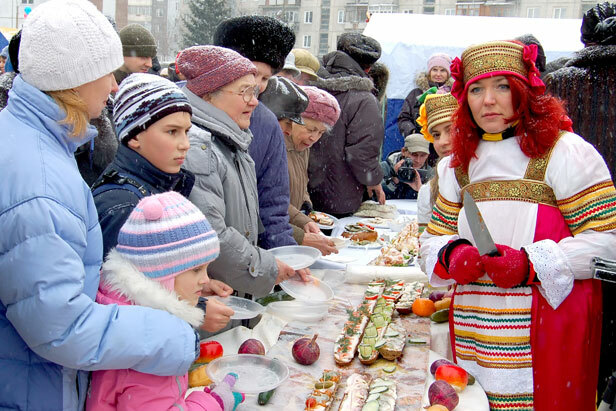 In January The people of Dobroye, a village in Lipetsk Oblast, 270 miles southeast of Moscow, celebrated their love of lard called "salo" in Russian by organizing the “Dobroye salo” (Good Lard) festival. In the Russian tradition salo is made of cured slabs of fatback (rarely pork belly), with or without skin. Many Russians believe salo is good for them and even keeps them slim. They say it contains amino acids that help burn fat in the body. Traditionally small slices of the white snack are eaten with black bread, garlic and vodka. The "Dobroye salo" festival was held at the local fair, where producers from across Lipetsk Oblast displayed salted, spiced, baked and smoked varieties in different shapes - pig being the most popular. Given the sucess of the initiative, the organizers have expressed their interest to make the festival annual, by inviting producers from neighboring regions.